Good news, netbook users: There's a reasonably easy way to install the Windows 7 Release Candidate, even if you don't have an external DVD drive. As you may recall from yesterday, Windows 7 gets downloaded as an ISO file and then extracted to a DVD for installation. But netbooks lack DVD drives, meaning you need to find a workaround. 1. Download the Windows 7 Release Candidate (32-bit) from Microsoft. 2. Connect your external hard drive to your PC (not your netbook). Ideally it should be empty, as it's going to get littered with Windows 7 installer files, but that's not crucial. You just need to make sure it has at least 5GB of available space. 3. In Vista: Click Start, type computer management, then press Enter. In XP: Head to the Control Panel, open Administrative Tools, and then open Computer Management. 4. Click Disk Management, then find your external hard drive in the list on the right (in the upper pane). 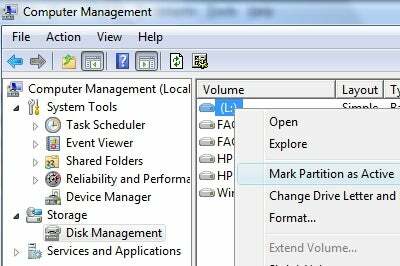 Right-click the drive and choose Mark Partition as Active. Approve whatever warnings Windows issues. 5. Now you need to extract the Windows 7 ISO file to your drive. I used the trial version of Undisker for this, but any number of utilities will do the job (including Nero, MagicISO, WinZip, etc.). If you go with Undisker, click File, Open, navigate to the folder containing your ISO, then open it. Click Image, Extract To, then navigate to the root folder of your external hard drive. Click Extract and wait a few minutes for the process to finish. 6. Safely remove your external drive, then plug it into your netbook and power up. It may be necessary to venture into the BIOS to change the boot order so that USB drives are detected first, but many netbooks let you bring up a boot menu by hitting a function key. On my Acer Aspire One, for instance, a tap of F12 during the POST screen lets me choose my desired boot drive. 7. Assuming the USB drive boots correctly, the Windows 7 installer should start right up. Follow all the prompts and you're on your way. This process worked like a charm on the Aspire One, which, incidentally can now boot Windows XP, Windows 7 Release Candidate, or Xandros Presto. I feel mad with OS power.